Water Heater Installation | Ken Neyer Plumbing, Inc.
We think tankless water heaters in Cincinnati are fantastic options for homeowners looking to make upgrades to their hot water systems. The conventional water heater—a storage tank water heater—holds a supply of water in a tank and keeps it at a constant temperature for when a tap turns on. A tankless water heater doesn’t store a supply of hot water at all. Instead, it heats up water when there’s a demand for it. Tankless water heaters offer a number of benefits for homes, provided professionals handle the job of finding the right sized unit and then properly installing it. If you have questions about installing a tankless water heater, please ask our experts anything and they’ll be happy to help. Below we’ve put down a list of misunderstandings about tankless water heaters we often have to clear up. A few weeks ago, we wrote a “for” and “against” article for the heat pump water heater. If we’re going to do that, then we have to follow up at some point with the tankless water heater and provide the same set of arguments. 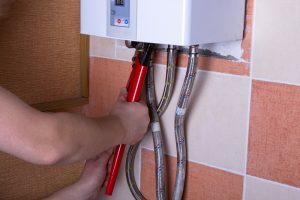 Tankless water heaters are popular options for water heater replacements, and they’re only going to become more popular as homeowners discover their numerous advantages. But as with any type of water heater, there’s no “one size fits all” answer. A tankless water heater may be unsuitable for your home’s water usage or your budget. The following “for” and “against” may help you start to narrow down your choice. But when it comes to making the final decision, please always work with a professional who understands tankless water heaters in Cleves, OH. Is This the Fall When I Should Replace My Old Water Heater? Fall is one of the two “shoulder seasons” the come between more intense weather. It’s during these times people often investigate replacing important comfort appliances. Often it’s replacing the heater or the air conditioner, but the water heater is another vital part of home comfort that will eventually need to be replaced. The water heater does much more work around the year than any furnace or air conditioner, since it has to operate almost every single day, and all that wear and tear accumulates until the unit has to be replaced. And, maybe, this is the fall when you need to replace yours? 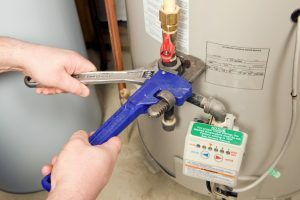 Posted in Water Heaters | Comments Off on Is This the Fall When I Should Replace My Old Water Heater? First off, we think heat pump water heaters are a great option for a homeowner to consider when it comes to shopping for new water heaters in Hamilton, OH. But we also understand that heat pump waters heater are not the ideal choice for every home and every situation. There are “cons” to go along with the many “pros” of this technology. In this post, we’re going to lay out—as fairly as possible—the case “for” and “against” installing a heat pump water heater as an alternative to the more conventional electric water heaters that use electrical resistance. You can find out more details, as well as schedule service to install a new residential water heater, by calling our office. You’re in the market for a new tank water heater. You either want to replace the aging water heater currently in your home, or you’re moving in a new home that doesn’t have a water heater yet. Whatever the case, you’ll have plenty of questions about buying a new water heater. A major one is how big the water heater needs to be. Too small, and your household won’t receive sufficient hot water. Too big, and you’ll have a massive energy wasting appliance on your hands. You shouldn’t worry about making the choice. Properly sizing a tank water heater is something to leave to plumbing professionals. They’ll make the calculations to determine the size and type of water heater to meet your family’s hot water demands without draining your bank account. 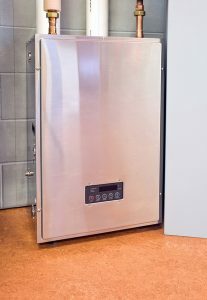 Do Tankless Water Heaters Need to Be Sized? How do you determine how large a storage tank water heater you need for a home? The sizing job is something you’ll need to have an expert plumber handle, but the basics of sizing this type of water heater is something anybody can understand: the more hot water demand there is in the house (usually because of the number of people in the household), the larger the storage tank itself needs to be. But what if you’re planning to install a tankless water heater for your house? As the name indicates, a tankless water heater doesn’t have a storage tank at all. Instead, it applies heat to water as it moves through the unit via a heat exchanger. The water is heated as it is needed (or “on-demand,” which is another name for this type of water heater). So, does this mean there isn’t any need to size a tankless water heater because one size fits all? Posted in Water Heaters | Comments Off on Do Tankless Water Heaters Need to Be Sized? Reduced energy consumption—they only heat up water as it’s needed! Tankless water heaters sound like they are a new form of technology, but the truth is a bit different. Let’s turn back the pages of history and learn more about the tankless water heater. Will a Tankless Water Heater Really Work for My Home? If you are looking into having a new water heater installed for your house during the fall (and fall is a great time to have this job done), you may be considering making the change from the standard storage tank water heater to a tankless water heater. With tankless water heaters becoming more popular each year, it’s tempting to put one at the top of your list of options. But you may also feel hesitant about it. Adopting any new technology creates a sense of risk in people. Is this “miraculous” tankless water heater really going to be able to meet your home’s hot water demands while saving money? Posted in Water Heaters | Comments Off on Will a Tankless Water Heater Really Work for My Home?